MAGNITOGORSK, Russia – Raphaël Lavoie (Chambly, Que./Halifax, QMJHL) scored twice, including the game-game winning goal with 8:53 remaining, to lead Canada’s National Men’s Under-18 Team to a 6-4 win over the United States in the opening game for both Thursday at the 2018 IIHF U18 World Championship. It is just the second regulation-time win for the Canadians in 15 games against their border rivals at U18 worlds; the other came in the 2013 gold medal game, a 3-2 victory in Sochi, Russia. The Americans erased a two-goal deficit to tie the game 4-4 with just over 10 minutes to go, but Lavoie answered almost immediately for Canada, redirecting in a feed from Liam Foudy (Scarborough, Ont./London, OHL) to restore the lead. Foudy finished with a goal and an assist, as did Kevin Bahl (Mississauga, Ont./Ottawa, OHL). Alexis Lafrenière (Saint-Eustache, Que./Rimouski, QMJHL) and Akil Thomas (Toronto, Ont./Niagara, OHL) had the other Canadian goals. The U.S. drew first blood when Joel Farabee beat Canadian goaltender Colten Ellis (Port Hawkesbury, N.S./Rimouski, QMJHL) just 4:56 in, but Lafrenière answered near the end of the opening frame, dancing around an American defenceman and snapping a quick shot past netminder Drew DeRidder to send the game to the intermission tied 1-1. Oliver Wahlstrom put the U.S. ahead again with a power-play goal early in the second period, but Canada took over from there, scoring three unanswered before the end of the stanza. Foudy was first, letting go a wrist shot that found its way through traffic and past DeRidder just 1:57 after the Wahlstrom goal. Bahl jumped in off the blue-line and went five-hole on DeRidder at 10:14 before Lavoie got his stick on a centering pass from Allan McShane (Collingwood, Ont./Oshawa, OHL) to make it a two-goal game after 40 minutes. Wahlstrom – on another U.S. power play – and Jack Hughes counted less than three minutes apart to pull the Americans back even before the quick answer from Lavoie put Canada ahead for good. Ellis turned away Farabee on a shorthanded breakaway with less than two minutes to go to preserve the advantage, and Thomas found the empty net with 19 seconds left to clinch the three points for Canada. 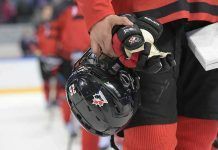 The Canadians are right back to action Friday at Arena Metallurg, taking on Belarus in the second of four preliminary-round games (10:30 a.m. ET/7:30 a.m. PT).